I charge 10 dollars an hour for my work, and I specialize in character art. This means I cannot quote an exact price, just give you an estimate. It depends how much time I take with it how much it will cost. More complicated, more hours, the more it costs. E-mail me at WCtrolls@gmail.com if you’re interested to get an estimate. 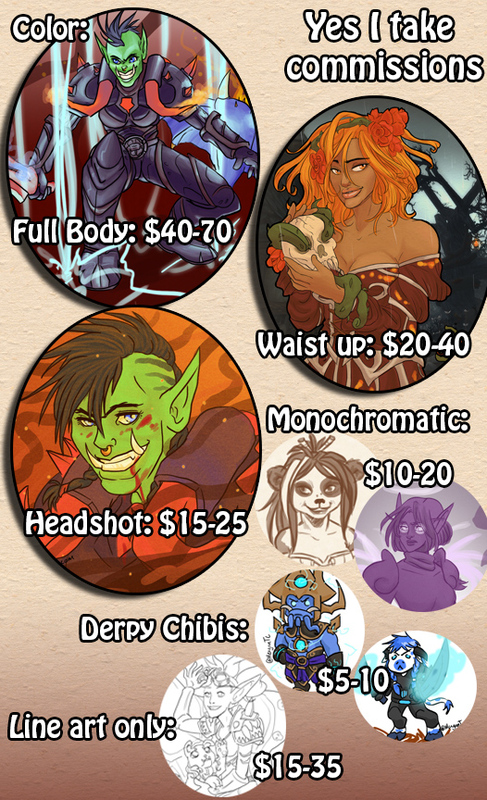 If you’ve decided you want to commission me you can email me with a description of what you’d like and I can give you an estimate for how much that would cost, or you can give me a budget and I can tell you what I can do for that much. This information will help my estimate to be accurate. I try to be flexible and like working for friends on projects that will make them happy. 😀 I hope to hear from you!